I guess this buildup may seem a little much. But, it took hours to connect all of the graphics with some sort of math that makes sense. Granted… “hours” was only two…but, still. The fact is, this event, just like the Christmas Event, is really kind of a no-brainer. If you check in every four hours (does that sound familiar? ), and do the tasks that are associated with that cycle, you should be able to reach all of the goals pretty easily…even without a bunch of Premium Characters. I’ll get into that in a minute. OK…so maybe I am pushing things a bit, and throwing a bit of panic your way…but realistically, 217 currency ducats every 24 hours, means you will have to hit 54.5 each cycle…4 times a day. I have 11 characters that earn 6 Poems (currency for the first act), and so that, is 66 every 4 hours. I’ll be ahead…even if I hadn’t bought Lil’ Vicki (I did, she reminds of Shirley Temple) or Flander’s Freaky Folks, Nedward and Capri (I did…they both earn separately), which actually earn 9 each per round. So…yes…use all of the characters at your disposal, every 4 hours, and you’ll hit it easily. There are some hilarious items coming…and they have also made it EAsy, but allowing you to keep working on Acts I, II, III, even if you haven’t finished the one before. Act IV is the only one that has a hard cutoff…but, as you can see from the calendar, it’s a bit of a “Dog” anyway! Dive in… put a little love in your life. Just enjoy the sweet, sweet rewards of tapping 4 times a day. (if you tap more than that…you may want to seek the help of a certified tapaholic therapist!). More on the Photo Tool…and the strange Land Conundrum associated with the Golden Goose Real Estate on Friday! 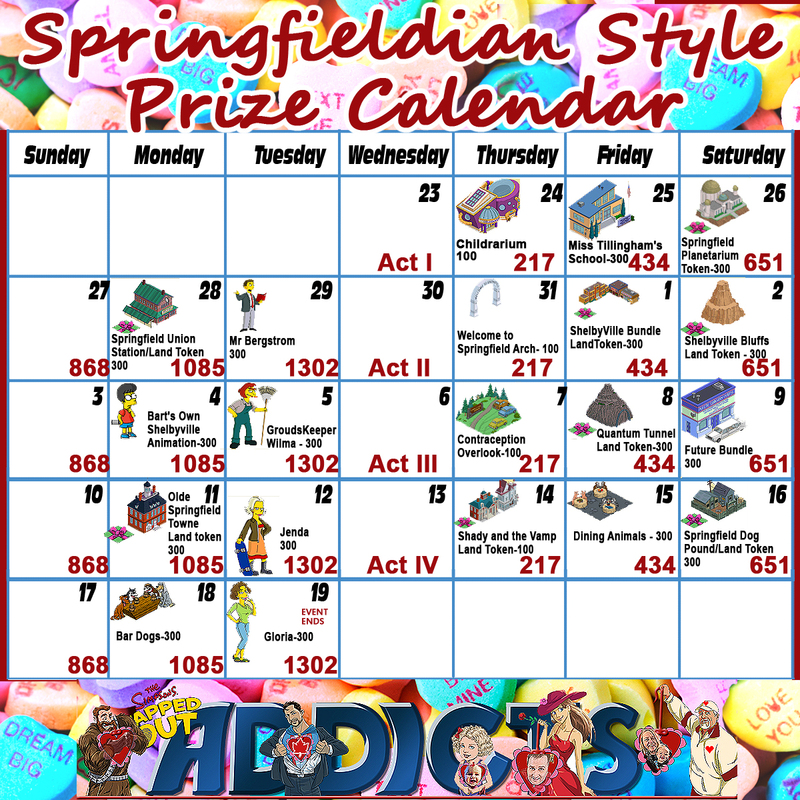 This entry was posted in Tapped Out and tagged Tapped Out Tips and Tricks, The Simpsons, The Simpsons Tapped Out, TSTO, TSTO Addicts, TSTO Calendar, TSTO Community, TSTO Love Springfieldian Style, TSTO Tips & Tricks, TSTO Tips and Tricks. Bookmark the permalink. I like these multi part events. I don’t feel the pressure to finish act 1 before act 2 starts. Can miss a day early on and not have to rush before the next act starts. One final deadline. Also looks like some great items this time around. going to have to make some room. Will the Flanders pair earn through the entire event, or is it act based like Christmas? Shady and the Vamp is the target for Valentines day or is it a suggestion for a present? Thank you so much for the calendar! Every day my schedule is different—sometimes I can tap 6 times a day, sometimes only twice. The calendar helps me know if I’m keeping up. I just appreciate y’all so much! You have added a lot of enjoyment and community feeling to the game. Happy Hearts to you!!! We don’t need no stinkin caledar. I didn’t know where else to put this at it concerns the previous event. In one of my extra spring fields I was unable to complete all the stages of the event, but it let me finish off the task to get Alice Glick, which I completed and got Alice, however she doesn’t have any tasks available, in each case in the list of jobs for her it says requires “quest,” I’m not sure how this can be resolved I presume it may be related to not completing other parts of the event on time. Can this be fixed, or shall Alice be doomed to springfieldian purgatory forever? Thanks Alissa, do you have a contact e-mail for them? Up at the top of this site, under the menus where it says Help Me! there’s a submenu called contact ea directly. Click on that and it will take you right there. Yay, I’m a lucky one! It is so much easier to do the events now, but the calendar is still appreciated. Patric, I love your Gregorian calendars. I find them extremely useful, refer to them often during events and appreciate them very much. I was so glad to see you’re still doing them. As for the photo tool, I think it works differently on different platforms. On my ipad, I just click on the little photo icon and in less than a minute, a photo of my entire town appears in my ipad’s photo gallery. Easy peasy. the prizes look fun. 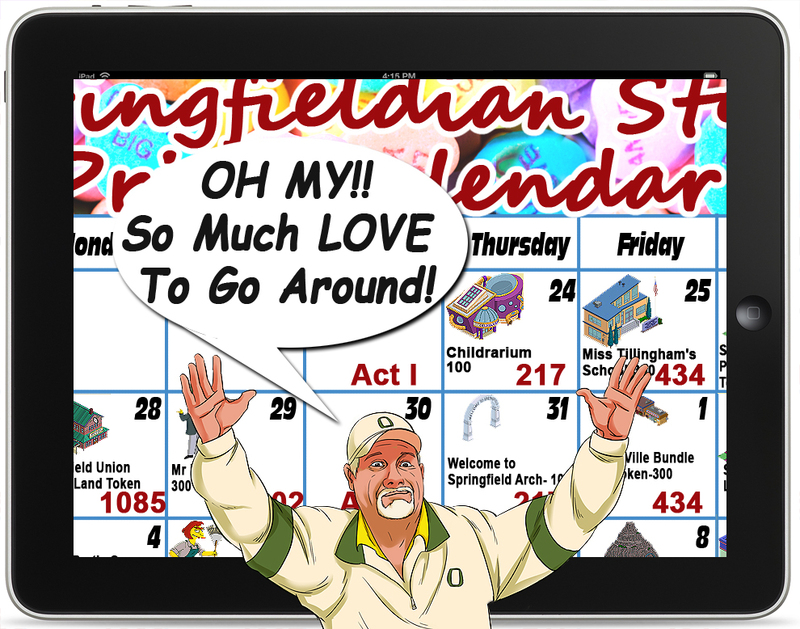 Now we have to make room for a Shelbyville and old Springfield… hooray!! Love the calendar and the prizes look great and nice to finally see Gloria can’t wait see what her line will be since she was at one point engaged to Mr. Burns and before that was with Snake. Seeing some Shelbyville stuff will make for some interesting decorating especially if they add more to it. Who is this “Shirley Temple” that you mentioned? Sounds like someone only old fogeys, who once used rabbit ears to capture grainy black and white movies, would remember. Neil Sedaka thanks you for the post. Now, to figure out where I want to put Shelbyville! BTW Act 3, 1st prize Contraception Overlook … Looks a little familiar, Tounge Kiss Point recycled? No, wait it’s different, Tounge Kiss Point has a motorcycle parked at it instead of 3 cars! Has anyone found a solution to the super zoom issue on Kindle? It makes gameplay painful. I’ve always considered Valentines’ Day to be one of the more “meh” events as a rule, but there’s some great stuff coming with this update. Shelbyville Bundle! We’re finally getting some more Shelbyville content! Thank you Patric. My finger is up for the tapaholic therapist 😖🥴😕. I am 54 and a tapa-tapa-holic! Is there a tapaholics anonymous? Although I must say, the last two weeks I have been so severely ill that I did not check in more than twice a day! 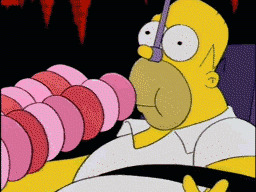 I am still very unwell, and I will not lose sleep over the Simpsons. Where does it save the town photo to anyway? Have you looked in “photos”? Sorry…that sounded snipey and wasn’t meant to be. On ios (mac or iPod), the photo just shows up in the “photos” section.